To being responding to your reviews, head to the "Respond" tab found on the left-hand menu. From there you'll see the section titled "EZ Response." This is where you can respond to your reviews. If you are a ResponseScribe client, you will not be able to see this section, but you are able to view the responses we've written for you by clicking on the "Review/Response Feed" tab. We've designed EZ Response to be, well, easy. From the EZ Response section you can view when the review was written, what location the review was written about, the site the review was written on, the star-rating the reviewer gave, and the written review. 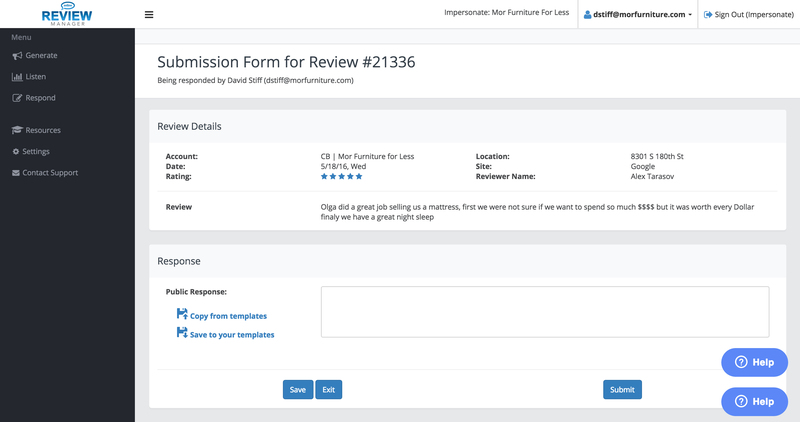 The reviews are automatically organized by date but you are also able to sort through them by review site or rating. To respond, simply click the blue button to the right of the review that says "Respond." From there you can personally respond to the review through the text box. If you have response templates created, you are able to copy them in here. Once you are done, click the blue "Submit" button and your response will be sent out.